Success for the top seeds, moreover at the 2018 Belgium Junior and Cadet Open in Spa on Saturday 21st April, it was success for the host nation; Nicolas Degros and Adrien Rassenfosse combined to win the Cadet Boys’ Team title. Furthermore, just as in the counterpart Cadet Girls’ Team event which went the way of China’s Ding Xinnan, Hou Suheng and Xu Yuhan, impressive performances secured the top prize. A three matches to one win against the Spain ‘B’ Team duo of Daniel Berzosa and Norbert Tauler, the no.5 seeds, secured a place in the final; awaiting was the French outfit formed by Fabio Rakotoarimanana and Felix Lebrun, the no.3 seeds. Notably the French duo was in form; at the semi-final stage they had recorded a three-two win in opposition to China with Fabio Rakotoarimanana the young man to shine. He beat both Gao Shentong (11-8, 11-8, 6-11, 11-4) and Zhao Jiaxin (11-13, 11-9, 11-5, 11-6), whilst teaming with Felix Lebrun to secure the doubles (11-9, 15-13, 16-18, 11-7). In the final, it was a different story, following defeat for Felix Lebrun in the opening match of the exchange against Adrien Rassenfosse (11-2, 11-6, 11-4), Fabio Rakotoarimanana was beaten in five games by Nicolas Degros, a contest in which he won the first two games and was on the brink of victory in the third (6-11, 9-11, 13-11, 11-6, 11-7). The win was a major boost for Belgium, the momentum in their favour, a doubles success ended matters (11-4, 11-6, 11-8). Impressive from Nicolas Degros and Adrien Rassenfosse; it was the same from Ding Xinnan, Hou Suheng and Xu Yuhan, like their male counterparts players with no world ranking and new to the international scene. At the final hurdle they accounted for Norway’s Martine Toftaker and Katarinq Wetzel, the top seeds; a three-one win being the verdict. Hu Suheng beat both Martine Toftaker (14-12, 12-14, 11-5, 11-6) and Kataraina Wetzel (11-8, 11-8, 11-8), whilst in addition Ding Xinnan accounted for Katarina Wetzel (13-11, 11-6, 3-11, 11-3). The one Norwegian success came in the doubles when Martine Toftaker and Katarina Wetzel beat Hou Suheng and Xu Yuhan (13-15, 3-11, 16-14, 13-11, 11-8). 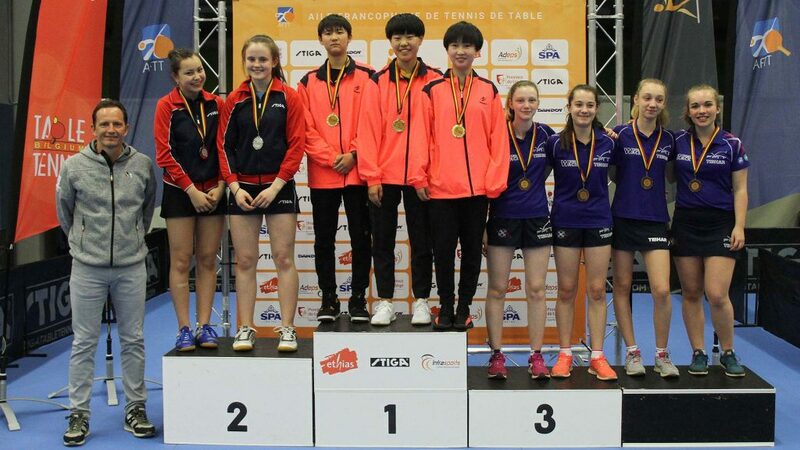 Gold for China, silver for Norway, it was bronze for France; at the semi-final stage the France ‘B’ Team duo of Chloe Chomis and Lucy Farcy, the no.6 seeds, suffered a three-nil defeat at the hands of Norway, by the same margin Lou Frete and Lucie Mobarek, the no.2 seeds, had experienced a reverse at Chinese hands. Attention now turns to the individual events in the Cadet and Hopes categories; play concludes in Spa on Sunday 22nd April.